"First, it's right there in the name. It's not the Practically Endless Sugar Sand Desert, you know." Set fourteen years, or so, after Alice's Adventures into Wonderland, this trip down the rabbit hole brings you to a fabulously different Wonderland. Alice's younger brother Henry, is sent to a bizarre world he refused to believe existed. Now that he's there, surrounded by the weirdly wacky his sister has been talking about, his best chance to get home is the Mad Hatter himself. Hatter, on the other hand, just wants to keep his head firmly attached to his shoulders, and his best chance for doing so is to do as ordered by the Red Queen, and bring 'Boy Alice' to her for a swift beheading. Packed with lushly described new sides of Wonderland, Mad About the Hatter, is so fluffy and lighthearted I couldn't stop grinning as I read. I loved the skill Chase showed in keeping her Wonderland as odd as the original, while also adding her own flare to the world with Drawrof and the Confection Mountains. While I did sometimes find myself longing for a bit more angst, and a deeper look into the relationship between Henry and Hatter, I was a huge fan of how Chase didn't have either character questioning why they were falling for someone of the same gender, it just was. I also really enjoyed the peek into Hatter's back story; though again, I found myself wanting to know more. Wanted to delve much further than the story allowed, and find out exactly how Hatter pissed Time off badly enough to be cursed as he was. As a novel classified as Young Adult, I found it very suitable for the younger end of that age bracket, with very minimal romance beyond a few kisses and some thinking, and next to no langue to speak of. Something I'd feel comfortable recommending, or gifting, to a reader as young as twelve. 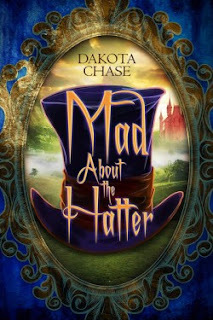 Mad About the Hatter was such a delightful read, that I can't help hoping there may be more of Hatter and Henry's adventures to be read in the future. Or, at least, something more with Chase's wonderful, whimsical writing. *laughs* I just read yours XD We do have quite similar tastes. We'll have to see how we do with Traffick. Did you just stock up on the recently added titles on edelweiss, too?